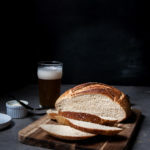 It might sound intimidating, but really, nothing will work harder for you in the kitchen than yeast. It’s the most active ingredient you’ll ever work with, it becomes a cooking partner if you can just follow it’s rules and it will do more for your bread than you do. And there is something about watching yeast dough rise, smelling it bake in your kitchen, and tasting it fresh from the oven that just has healing powers. 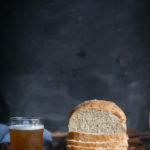 Just follow the simple steps: make sure the yeast hasn’t expired, make sure the temperate is correct (use a cooking thermometer), and make sure your kitchen isn’t too cold, and you’ll be fine. You’re yeast will work for you to make a gorgeous loaf. 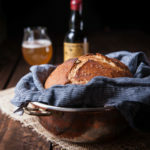 Then theres the beer, that has it’s own yeast, and it’s made from bread like ingredients. It’s a bread makers dream when it comes to baking the perfect batch of cinnamon rolls. You’ll get more than what you’ve worked for, and a batch of unforgettable rolls that are more than worth the effort they took. Plus you’ll be able to serve beer for breakfast, and that’s a dream all on it’s own. In the bowl of a stand mixer fitted with a dough hook add the flour, sugar, rapid rise yeast (do not use regular dry active yeast), and dry milk powder. Stir to combine. In a microwave safe bowl, melt the butter. 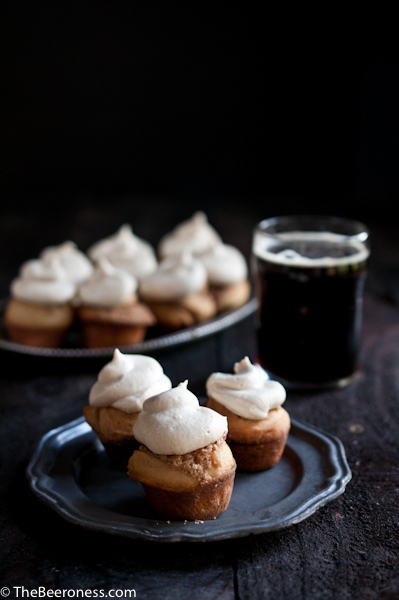 Add the cream and stout, microwave for 15 seconds, test temperature and repeat until the temperature of the liquid reaches between 120 and 125 degrees. Add liquid to the mixer and stir until incorporated. Add the egg yolk and salt, mix on medium high speed until dough comes together and gathers around the blade. Place the dough in a lightly oiled large bowl, cover with plastic wrap and allow to sit in a warm room until doubled in size, 1 ½ to 2 hours. On a lightly floured surface roll out the dough to an approximately 12 inch by 16 inch rectangle. In a bowl stir together the butter, granulated sugar, brown sugar, and cinnamon. 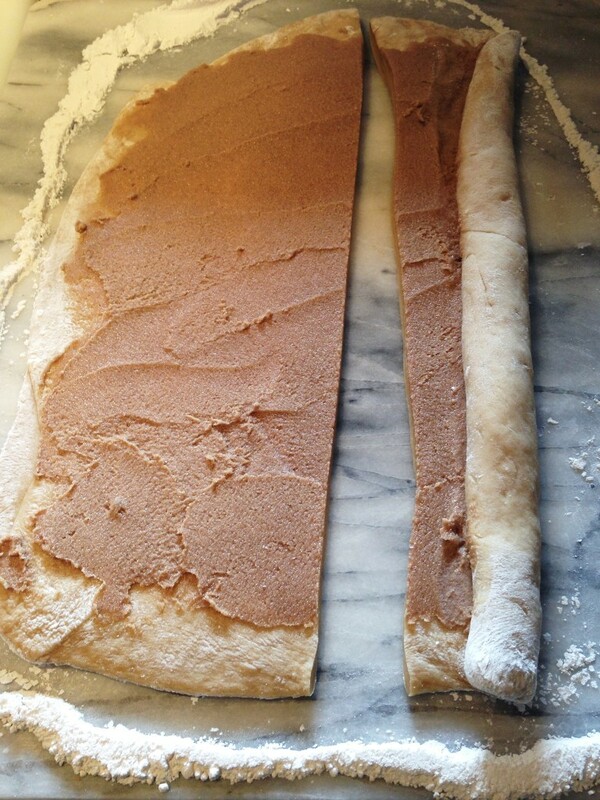 Spread the cinnamon-sugar butter evenly over the dough. 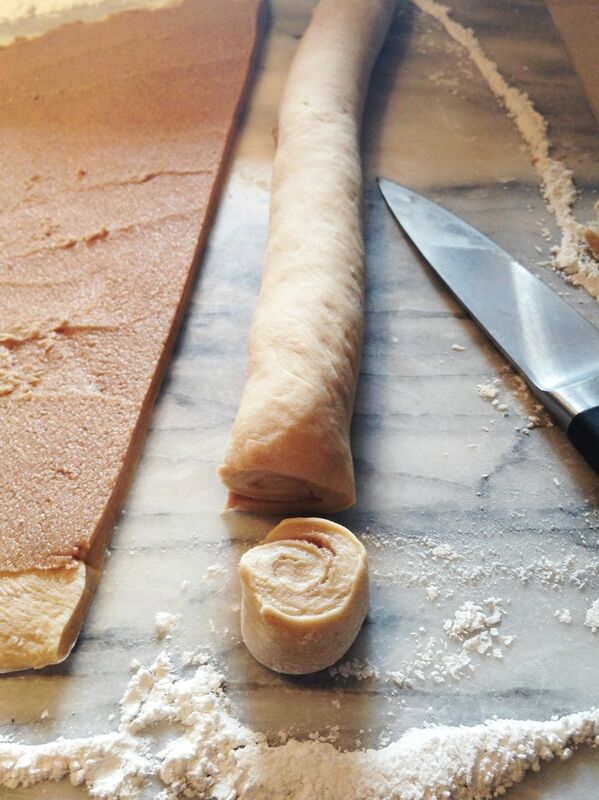 Cut the dough in half, lengthwise. Starting at the long end, roll each half into a tight log. Cut each log into 1-inch rolls, place cut side up in a mini muffin tin (or tightly into a baking dish) that has been sprayed with cooking spray. Cover and allow to rise until doubled, about 45 minutes (to make ahead, the second rise can take place over 12 hours in a refrigerator. Remove from fridge and allow to come to room temperature the following day prior baking). Heat oven to 350. Bake until golden brown, about 22-25 minutes. 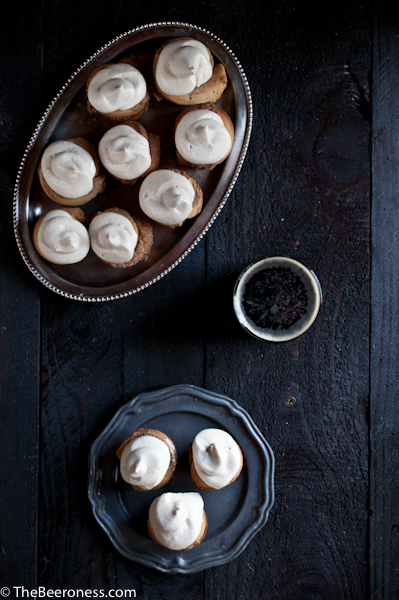 To make the frosting, beat the softened butter and softened cream cheese until well combined and fluffy. Add the powdered sugar and mix until well combined. Add the beer and mix until light and fluffy. 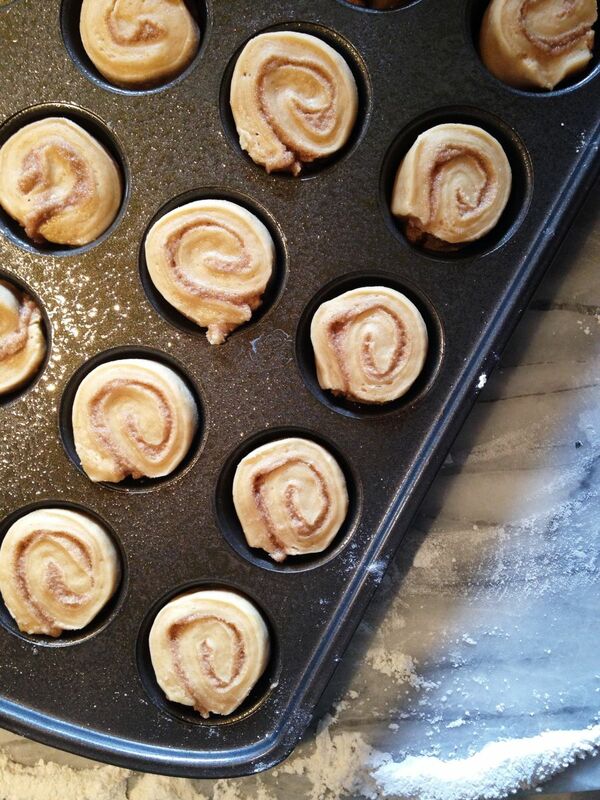 Spread frosting on rolls prior to serving. This is such a cool idea!! 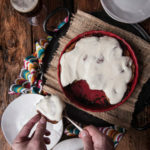 Totally one for the books – I’m a cinnamon roll fiend! Oh, I love cinnamon rolls. Gotta give this one a try soon. Love it! 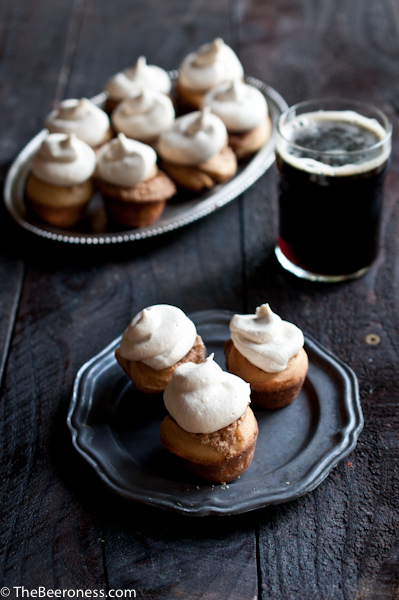 It’s amazing to see what new recipes you come up with for incorporating beer into food, especially into desserts! These are so fun. Miniature is always cuter! They sound and look delicious! I just love it! My family enjoy them so much, that they’re hinting: REPEAT, PLEASE!!! !